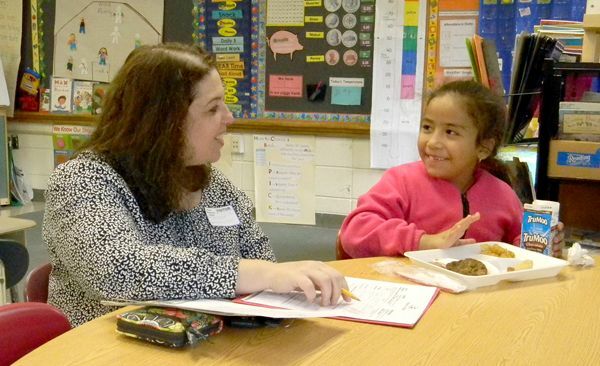 Shown in picture, first grader Beyonce Ayala is all smiles during her first session with mentor, Deb Hollett. A national reading outreach program, “Read to a Child,” was introduced locally at Richer School earlier this year with hopes of boosting student performance by matching children with volunteer mentors/readers. Specifically, the mission of Read to a Child is to increase children’s success in reading and in life by inspiring adults to read to them regularly. At the same time, the program offers willing volunteers with a proven, “turnkey” opportunity to have a positive impact on kids. The program is currently being offered to first graders at Richer. However, as more volunteers become available, the goal is for the program to expand to other grades. Linda Winin, Read to a Child’s Program Coordinator for this area, is currently seeking willing local companies to promote the idea as a meaningful way for their employees to serve the community. The initial launch of the program at Richer School began with recommendations made by first grade teachers who were asked to identify children in their classrooms who meet one or more of three key criteria – they are behind their age group in reading proficiency; they would benefit from the attention of a caring adult; and/or they are not read to at home. Each of Richer’s six, first grade teachers were asked to identify four students who met the criteria, resulting in a list of twenty-four children awaiting mentor/readers. As volunteers become available, parents are informed of the opportunity and asked to sign off on the program. Once approval is granted and a match is made, the volunteers visit the school once a week to read with their partner child during lunchtime. Currently, ten matches have been made, so there remains a significant need for more volunteers to step forward. Each of the corporate partners has made a donation to the program and promoted the opportunity to their employees. As the program becomes more widely known in Marlborough, Winin is hopeful that more companies will sign on so that matches can be found for everyone on Richer’s list of twenty-four first graders. According to Winin, research indicates that the simple act of regularly reading aloud to a child significantly impacts his or her literacy skills and, thus, his or her likelihood for success. Read to a Child’s 2012-2013 annual report, indicates that 88% of first-year students improved in one or more of the following areas – vocabulary, listening comprehension, ability to articulate thoughts, self-confidence, enthusiasm for books and reading, and overall reading ability. Reading mentor, Deb Hollett, is now in her fourth year serving as a mentor/reader. She began in 2011 after being matched with a second grade girl in Framingham. “I did not know the need was there,” she said. The pair hit it off right away and Hollett said it was a positive experience from the start. Hollett continued to meet regularly with the same student all the way through fourth grade. “It was nice to see how excited she would be to get together,” Hollett said. When her job moved to Marlborough, it became a natural fit for Hollett to help get Richer’s program off the ground. Courtney Treadwell also began as a mentor/reader in Framingham and switched to Richer School this year. As a longtime volunteer in the schools, Treadwell said she was well aware of the importance of reading. She mentored the same boy for two years during his time in grades two and three. Treadwell found it initially difficult to connect with her student who was not that interested at first and was hesitant to open up. Nevertheless, she persevered, and slowly over time she began to see positive progress. “It was much easier the second year,” she said. Mary Garner serves as the school coordinator for the Read to a Child program at Richer. As a regular volunteer at the school and current co-president of the PTO, the coordinator position is a natural extension of work she had been doing. She is very positive about what she has seen so far and hopeful the program will grow. “The kids are really excited about it and looking forward to when their readers come in,” she said. Given the circumstances faced by the children who are selected for the program, some will require more time than others to fully embrace the experience. Training is provided to all volunteers to help with the process. “We aim to make sure that a partnership with Read to a Child allows for employees to have an exceptionally enjoyable and convenient volunteer opportunity,” said Winin. In 2012-2013, approximately 1,400 reading mentors engaged in 35,000 hours of individualized reading sessions in the Boston, Detroit, Hartford, Los Angeles, and Miami regions. With the program now available in Marlborough, Winin will be working to recruit companies not only to match mentors to the remaining first graders on the list, but also to expand to other grades and provide coverage for next year’s collection of new first graders. For more information about the program, visit www.readtoachild.org. To inquire about participating, contact Winin by phone at 617-670-0881 or send her an email to linda.winin@readtoachild.org. This story is taken from the Fall/Winter 2014 edition of “Panther Pride,” a publication of the Main Street Journal produced in partnership with Marlborough Public Schools. The print edition of Panther Pride is included as a second section with this week’s (November 29th) Main Street Journal.